More prominent Hempsters of the Reform Movement. 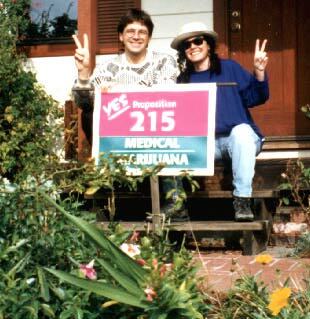 Proposition 215, the California Medical Marijuana Initiative was placed on the California ballot in 1996 and passed with 56% of the vote. The photo was taken in front of their home in the weeks before the final vote. Chris Conrad and Mikki Norris with Marc Emery, Don Wirtshafter, and Dana Larsen at Hemp BC in Ontario. Photo shows (l-r) Chris Conrad, Mikki Norris, friend, Marc Emery of The Marc Emery Seed Company, Don Wirtshafter of the Ohio Hempery, friend, Dana Larsen of Cannabis Culture magazine, and a friend, in Vancouver BC Canada for the Industrial Hemp Expo, 1997. 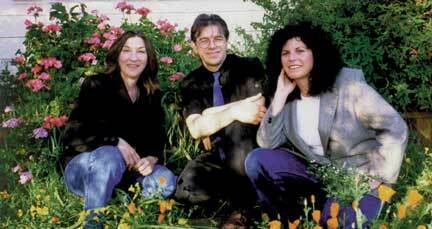 Chris and Mikki with Virginia Resner in 1998, coauthors of Shattered Lives: Portaits From America's Drug War and Human Rights and the US Drug War. They were the trio behind the formation of the Human Rights and the Drug War Project in 1995 and continued through to the production of the book Shattered Lives: Portraits From America's Drug War. The project puts a human face on the drug war by showing the faces and telling the stories of prisoners of the Drug War and their families. Click here to visit the HRDW website.